Food attracts people who attract more people. 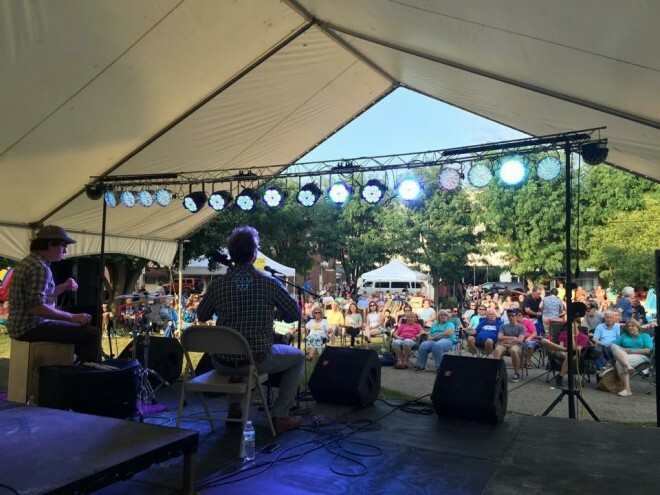 How did the small Appalachian city of Corbin, Kentucky reduce its downtown vacancy rate from 40% to nearly 0% in only three years? The answer lies in part with a thriving local food movement and the 2013 opening of a new farmers market on Main Street. To learn more about this remarkable transformation, PPS recently caught up with Corbin’s Main Street Director, Andy Salmons. A longtime placemaking advocate, in 2014 Andy traveled to New York to attend PPS’s training course, “How to Create Successful Markets,” to learn more about how thriving public markets can shape and support economic development on Main Street. Just two years prior, in 2012, Corbin residents had little reason to visit or spend time downtown, as it was largely empty and economically strapped. 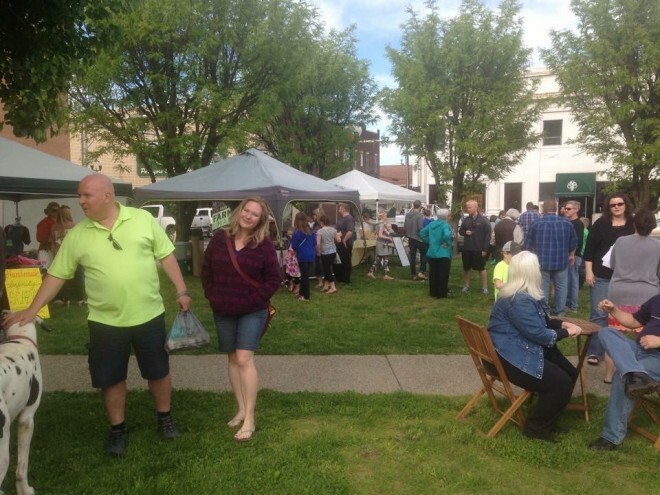 But by the time of Andy’s visit to the PPS office, the city of Corbin was already in the midst of a renaissance—an economic upturn fueled by the local food movement, the success of the farmers market, and a strong community that is willing to go to great lengths to support the both town and each other. Today, downtown Corbin is bustling. There are almost no vacant buildings in the downtown area, which now houses more than 20 new businesses including two co-owned by Andy: a popular café called You, Me, Coffee and Tea and a farm-to-table restaurant called The Wrigley Taproom and Brewery. Along with their desire to support Corbin’s emerging food scene and local businesses, residents flock to Main Street for all kinds of community-fueled events, such as the Color Corbin 5K run, the annual holiday window decorating contest and Christmas Parade, Moonbow Nights, and autumnal Oktoberfest celebrations. When I spoke with Andy during our phone interview, he was in the coffee shop that he co-owns. In the background I could hear the quiet hum of music and customers, several of whom were gently laughing at him for talking too loudly. He moved to a more secluded corner and told me the story of bringing the Farmers Market to downtown Corbin in the spring of 2013. Before then, to get their fix of fresh, local produce, Corbin residents would have to travel to the Whitley Farmers Market on Saturday mornings in the neighboring town of Williamsburg, a twenty-minute drive straight south. Even though this market is great and well-attended, Andy explained that it was “out of the way, on a country road, and not easily accessible.” So he reached out to the Market’s leadership and proposed a Lighter Quicker Cheaper approach for transforming a vacant downtown lot into a Corbin outpost of the Whitley Market. The team got to work quickly and cheaply; they installed planters with flowers and herbs along the roadway, they built a stage out of used pallets, and invited local musicians to perform during market hours. The market later brought in a mobile crèpe stand, as well as a coffee station furnished by Andy’s successful downtown café. People were soon flocking to the market to hang out, have dinner, and listen to music—all while shopping for their fresh, locally-sourced food. In addition to the regular market staples, they hosted special events to add to the mix and make the market a real community destination. What started as an impromptu market-wide barbeque became a quick favorite amongst customers and vendors alike: “We set up a big grill and got food from different vendors and put it on kebabs so people could really get a taste of the entire market.” any of the vendors began to realize that value-added and prepared food would offer a huge opportunity not only to turn a profit at the market, but also for launching new products. This was the case for farmer/vendor Kristin Smith, who began making specialty hamburgers and pork belly tacos from the free-range beef and pork she produced for the Farmers Market. 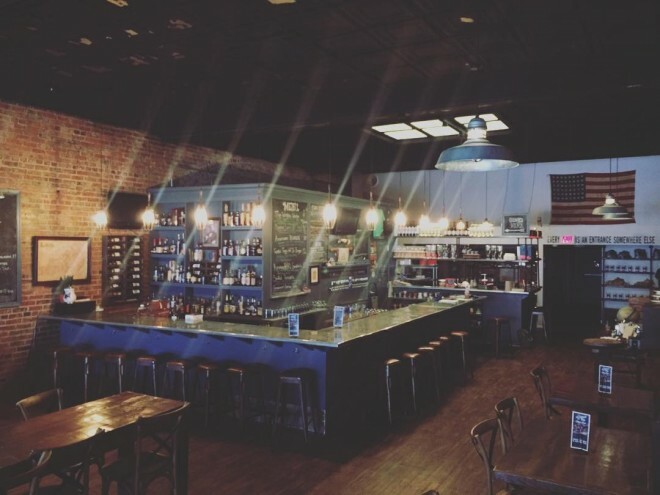 She turned the success of this experimentation into a brick-and-mortar enterprise, partnering with Andy and John Baker (of “Oui Creperie”) to create The Wrigley Taproom and Brewery in late-2014. “We used our farmers basically as an incubator for agricultural and artisan-based entrepreneurship,” Andy told me. “By treating it like an incubator, we’ve really been able to direct people that are growing into some vacant storefronts downtown. And this has had a multiplying effect where people are having successes, people are having fun, and there’s a lot of activity going on downtown.” Seeing this success, community members want to support each other by purchasing local products, and still more want to get involved and “have a go at their dream” of owning a small business. In the first year, the market grew from 30 to 48 vendors (25-30 of which sold at the Corbin market regularly), and sales doubled. Today, it has 52 vendors and an eclectic product mix that includes a wide assortment of produce and meat, as well as specialty items like local honey and crafts and artisan products. In recognizing the increasing benefits of food-fueled economic growth, federal agencies are also beginning to “[partner] with regional economic development efforts to put new resources behind the power of local food to advance a range of objectives, from Main Street commerce to greater access to Healthy Foods,” reports Patty Cantrell of Regional Food Solutions. In 2014, Corbin and the Whitley County Farmers Market received support to extend their work even further from the Local Foods Local Places Grant Program—an innovative federal partnership dedicated to helping communities create walkable, healthy, and economically vibrant neighborhoods by strengthening local food systems. Only a few short years after opening, the farmers market has brought people, business, and energy back to a rural Main Street that had been struggling for decades. The vacancy rate peaked at 40% in 2012, but today it is less than 5%—and almost all of the still-empty storefronts have been purchased by property owners who are renovating the spaces for an upcoming project. And the future is bright. When I asked Andy what’s next for Corbin, he explained that there is a big push to increase housing downtown, and they are working to put programs in place to help property owners renovate second floor spaces into apartments. The city is also looking to provide infrastructure for a year-round market in Corbin. 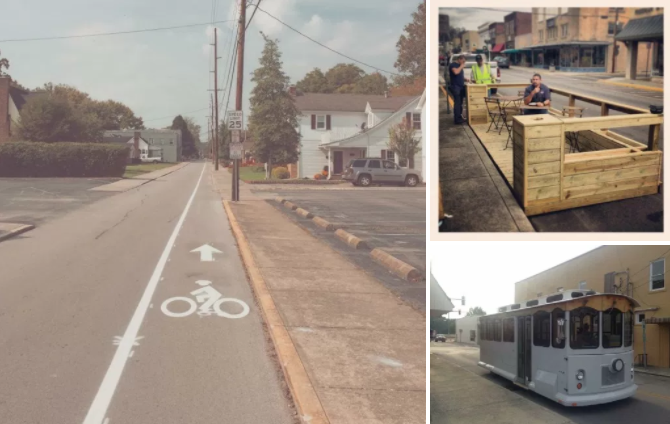 Left: Corbin, KY continues to add bike lanes and extended sidewalks.Right Top:Holding court at a temporary parklet, called “Pocket Park.” Right Bottom: The new downtown trolley is slated to be in service this spring! A skilled entrepreneur and seasoned placemaker, Andy had been a longtime fan of both PPS and the work of Holly Whyte. Though he was a bit concerned about coming across as too much a “fanboy,” as he joked during our interview, he recalled seeing a bootleg copy of Holly Whyte’s documentary The Social Life of Small Urban Spaces many years ago and being inspired. “That’s what got all this rolling for me,” he told me, and if anyone has ever more successfully demonstrated Whyte’s idea that small elements can have a “large multiplier effect,” I’d like to meet them. The message of placemaking—not worrying about finding a lot of money, just finding what you can and actually doing it—well, that’s pretty much what we did. We started that market on nothing. The sense of ‘we want to make this a destination, we want to do placemaking here even though we don’t have much money, we want to do it as quickly and cheaply as possible—all of that kind of led into what now is a well-funded and nationally-recognized market. It’s really humbling. And these are all concepts, honestly, that in some form or fashion we’ve modeled upon PPS principles.